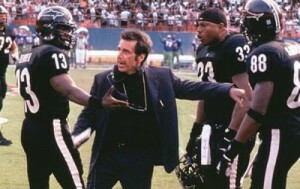 Al Pacino (Stand Up Guys) fights battles on and off the field in Oliver Stone’s (Savages) sports movie Any Given Sunday. Not one of critics’ favorite films of three-time Academy Award-winning director Oliver Stone, Any Given Sunday nevertheless clicked with fans, grossing a tidy $75.5 million in theaters and a 74% moviegoer approval rating on Rotten Tomatoes. Our Disc Dish critics are on the more positive side for the film. While not a favorite, it’s a good one to have in your collection if you’re a fan of Pacino, Stone or definitely football. Even if you’re not into the actors and drama, the game footage is gorgeous. 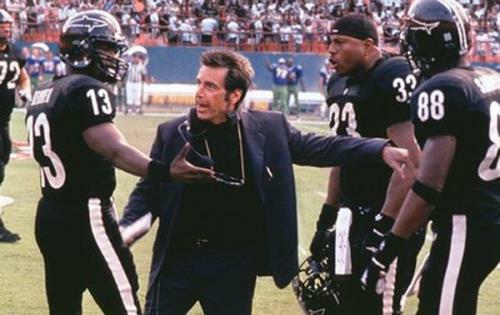 Rated R, Any Given Sunday stars Al Pacino as Tony D’Amato, head coach for the fictional Miami Sharks football team, who won back-to-back championships four years ago. When the owner dies and his headstrong daughter (Cameron Diaz, The Counselor) takes over the team, she has other ideas about how it should be managed, including keeping a tight grip on the bottom line. Meanwhile, on the players’ side, longtime quaterback “Cap” Rooney (Dennis Quaid, The Words) is being edged out in favor of third-string rookie Willie Beaman (Jamie Foxx, White House Down). James Woods (Straw Dogs), LL Cool J (TV’s NCIS: Los Angeles), Ann-Margret (Tommy) and Charlton Heston (Ben-Hur) also star in the film. retrospective featurette “Anything Can Happen,” with NFL stars Marshall Faulk and Willie McGinest, 49ers coach Steve Mariucci and Cowboys owner Jerry Jones.